This was a really sweet novella, and if you've enjoyed Backman's other works, you'll enjoy this. I wasn't as captivated by Noah and his granddad in this book as I had been by the characters in Backman's other books; I actually thought Ted, Noah's dad, was more intriguing, perhaps because of the conflict. Nonetheless, this was still strong and definitely had the emotions that I look forward to in his books. I've now read a view varying depictions of characters suffering from Alzheimer's and I felt like this was a more emotional one that also led to a lot of understanding. This is a perspective I wouldn't otherwise get. I did feel like I wanted this to be a fully fledged book, though I'm not sure where else it would go. I think that's partially a result of my not generally reading novellas though; I felt like I got involved just for the end. But this was definitely worth the time. From the New York Times bestselling author of A Man Called Ove, My Grandmother Asked Me To Tell You She’s Sorry, and Britt-Marie Was Here comes an exquisitely moving portrait of an elderly man’s struggle to hold on to his most precious memories, and his family’s efforts to care for him even as they must find a way to let go.“Isn’t that the best of all life’s ages, an old man thinks as he looks at his grandchild, when a boy is just big enough to know how the world works but still young enough to refuse to accept it.” Grandpa and Noah are sitting on a bench in a square that keeps getting smaller every day. The square is strange but also familiar, full of the odds and ends that have made up their lives: Grandpa’s work desk, the stuffed dragon that Grandpa once gave to Noah, the sweet-smelling hyacinths that Grandma loved to grow in her garden. As they wait together on the bench, they tell jokes and discuss their shared love of mathematics. Grandpa recalls what it was like to fall in love with his wife, what it was like to lose her. She’s as real to him now as the first day he met her, but he dreads the day when he won’t remember her. 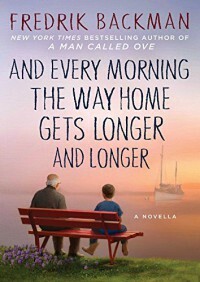 Sometimes Grandpa sits on the bench next to Ted, Noah’s father—Ted who never liked math, prefers writing and playing guitar, and has waited his entire life for his father to have time for him, to accept him. But in their love of Noah, they have found a common bond. Grandpa, Grandma, Ted, and Noah all meet here, in this peculiar space that is growing dimmer and more confusing all the time. And here is where they will learn to say goodbye, the scent of hyacinths in the air, nothing to fear. This little book with a big message is certain to be treasured for generations to come.